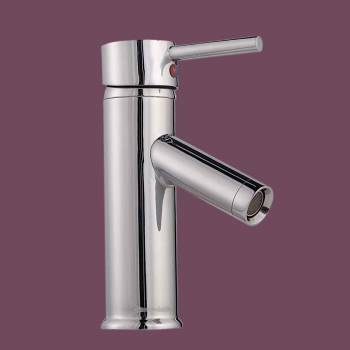 Modern single hole faucets are a riveting addition to any to any bathroom! You will not find a better faucet for this price. Measures 6 in. high and 1 1/2 in. from spout to counter. Single Hole Faucets: Our single lever faucet is constructed of solid brass, chrome-plating finish, and has a top rated 500,000 cycle cartridge. 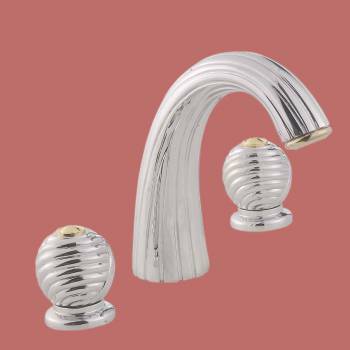 This short single lever faucet has a curved spout and round body. Faucet comes with supply lines and mounting hardware. Measures 9 1/2 in. H x 5 1/2 in. proj. x 5 1/2 in. from spout to counter. 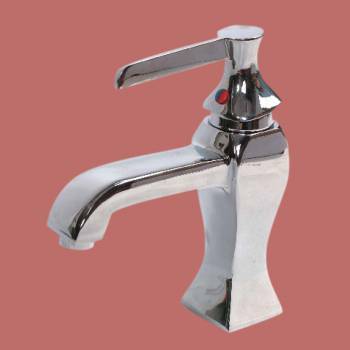 Single Hole Faucets: ROUND body and round base. 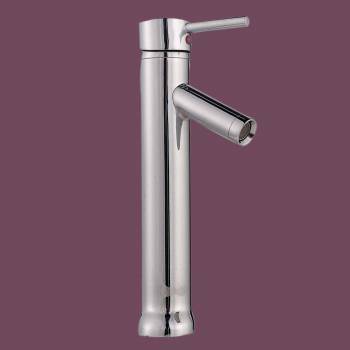 Our single lever faucet is constructed of solid brass & has a tarnish resistant chrome plated finish. It boasts a top rated 500,000 cycle cartridge. 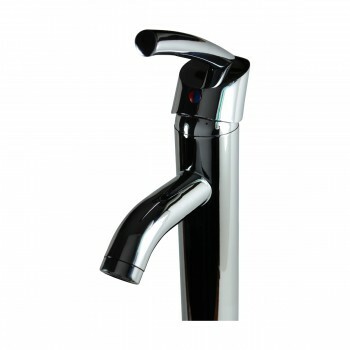 Designed with an elegantly curved spout & lever, it definitely has a modern flair! Supply lines and mounting hardware included. Measures: 10 1/4 in. high x 5 1/2 in. from spout to counter x 5 3/4 in. proj. Single Hole Faucets: Our single lever faucet is constructed of solid brass, chrome-plating finish, and has a top rated 500,000 cycle cartridge. 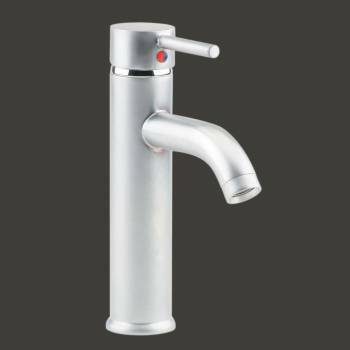 This short single lever faucet has a curved spout and round body. Faucet comes with supply lines and mounting hardware. Measures 6 3/4 in. H x 5 3/4 in. proj. x 2 1/2 in. from spout to counter. Single Hole Faucets: Our single lever faucet is constructed of solid brass PVD, and has a top rated 500,000 cycle cartridge. 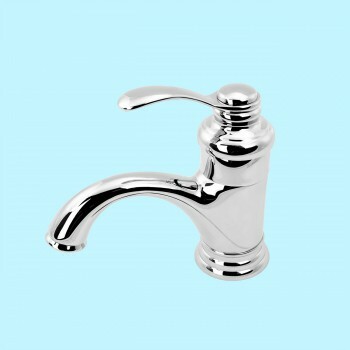 This short single lever faucet has a curved spout and round body. Faucet comes with supply lines and mounting hardware. Measures 12 in. H x 5 1/2 in. proj. x 7 1/2 in. from spout to counter. This charming single-hole faucet is a great accent in any bathroom! 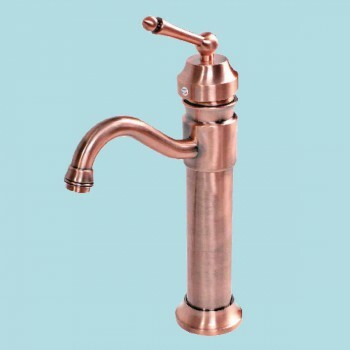 Constructed of solid brass with a tarnish resistant antique-copper finish this faucet easily stands up to daily wear & tear. It boasts a top rated 500,000 cycle cartridge. Spout is stationary and does not swivel. Supply lines and mounting hardware included. Large Rondelle measures: 11 3/4 in. high x 9 in. proj. x 7 in. from spout to counter. Single Hole Faucets: Our single lever faucet is constructed of solid brass, chrome-plating finish, and has a top rated 500,000 cycle cartridge. This short single lever faucet has a straight spout and round body. Faucet comes with supply lines and mounting hardware. Measures: 7 in. H x 5 in. proj. x 2 in spout to counter. Bathroom Faucet Fixture. Widespread Faucet. 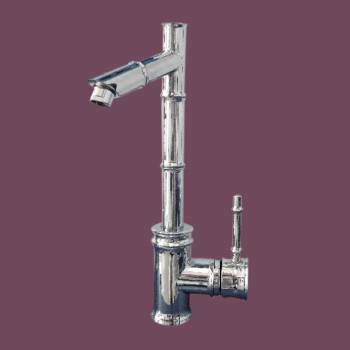 Decorative widespread faucets are an elegant addition to any to any bathroom! 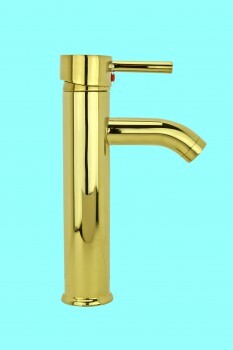 You will not find a better faucet for this price! Single Hole Faucets: Our single lever faucet is constructed of solid brass, chrome-plating finish, and has a top rated 500,000 cycle cartridge. 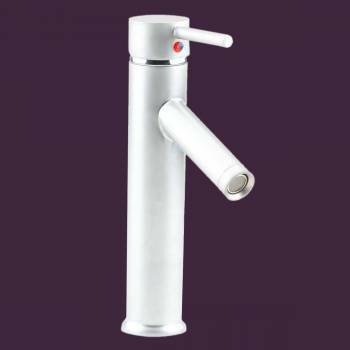 This tall single lever faucet has a straight spout and round body. 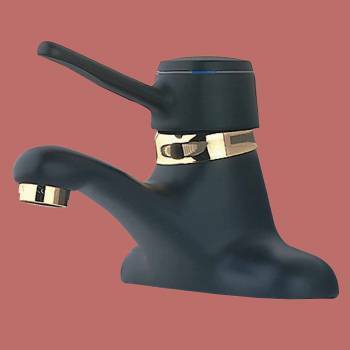 Faucet comes with supply lines and mounting hardware. Measures 12 in. H x 4 3/4 in. proj x 7 in. from spout to counter. Black nickel finish on brass 4 inch centerset faucet. One lever operation. 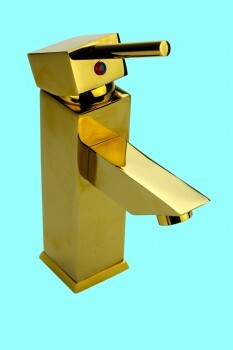 You will not find a better faucet for this price! Measures: 5 1/4 in. H x 6 in. spout projection x 1 7/8 in. spout to counter height. Single Hole Faucets: Our single lever faucet is constructed of solid brass, chrome-plating finish, and has a top rated 500,000 cycle cartridge. 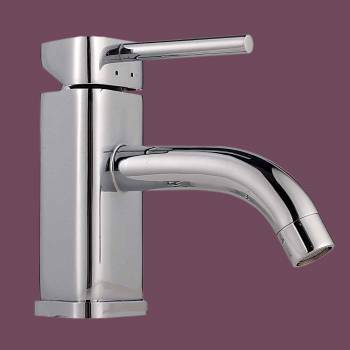 This tall single lever faucet has a curved spout and round body. Faucet comes with supply lines and mounting hardware. Measures 12 in. H x 5 1/2 in. proj. x 8 in. from spout to counter. Single Hole Faucets: Our single lever faucet is constructed of solid brass, chrome-plating finish, and has a top rated 500,000 cycle cartridge. This short single lever faucet has a straight spout and round body. Faucet comes with supply lines and mounting hardware. Measures: 10 in. H x 5 1/2 in. proj. x 5 in. from spout to counter. 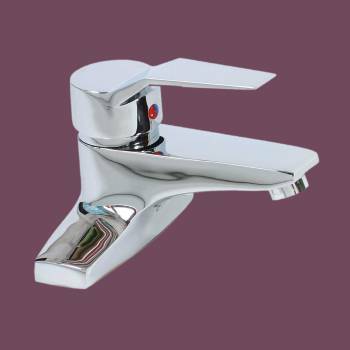 Bridge Faucet: Chrome plated, solid brass, 4 in. 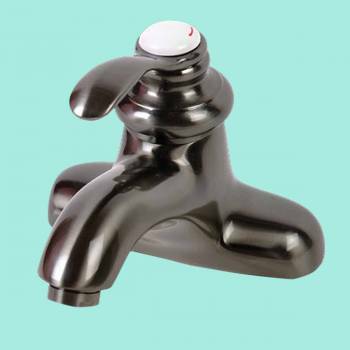 centerset bridge faucet comes with cross handles and a single spigot measuring 5 in. high. The spigot projects out 5 in. The diameter of each faucet base is 2 1/2 in. It has ceramic washerless valves. Pull out plug not included. Does not include pop-up drain. NOTE: May require 4 inch centerset plate or sink hole plug for installation on 4 inch centerset sinks with 3 faucet holes, not included. This faucet is NOT compatible with Portsmouth and Cloakroom sinks. Single Hole Faucets: Our single lever faucet is constructed of solid brass, chrome-plating finish, and has a top rated 500,000 cycle cartridge. 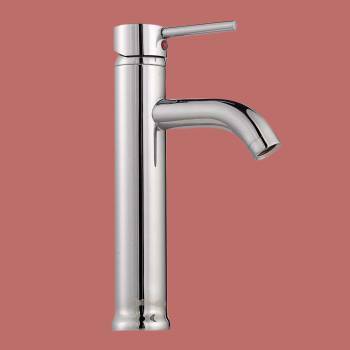 This short single lever faucet has a curved spout and triangular body. Faucet comes with supply lines and mounting hardware. May have small weld spots near faucet spout. Measures: 5 3/4 in. high x 1 in. from spout to counter. Single Hole Faucets: Our single lever faucet is constructed of solid brass, chrome-plating finish, and has a top rated 500,000 cycle cartridge. 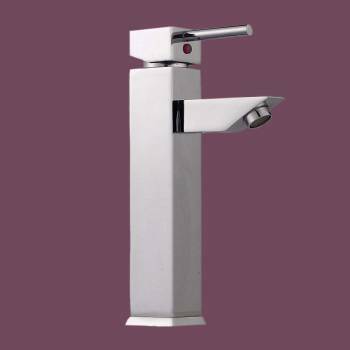 This tall single lever faucet has a straight spout and square body. Faucet comes with supply lines and mounting hardware. Measures 12 1/4 in. high and 8 3/4 in. from spout to counter. Single Hole Faucets: Our single lever faucet is constructed of solid brass, chrome-plating finish, and has a top rated 500,000 cycle cartridge. 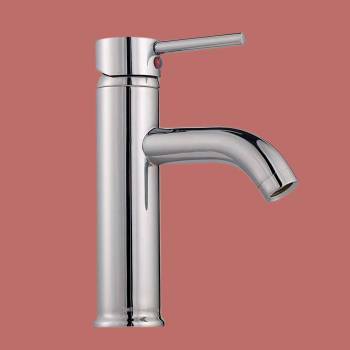 This short single lever faucet has a straight spout and square body. Faucet comes with supply lines and mounting hardware. Measures 7 1/2 in. high and 4 in. from spout to counter. Single Hole Faucets: Our single lever faucet is constructed of solid brass PVD, and has a top rated 500,000 cycle cartridge. This short single lever faucet has a straight spout and round body. Faucet comes with supply lines and mounting hardware. Measures: 10 in. H x 5 1/2 in. proj. x 5 in. from spout to counter. 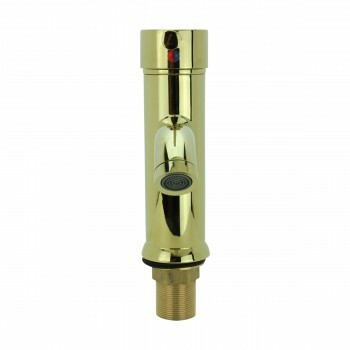 Polished Brass Faucet, Single Hole Faucets: Our single lever faucet is constructed of solid brass PVD, and has a top rated 500,000 cycle cartridge. This short single lever faucet has a straight spout and round body. 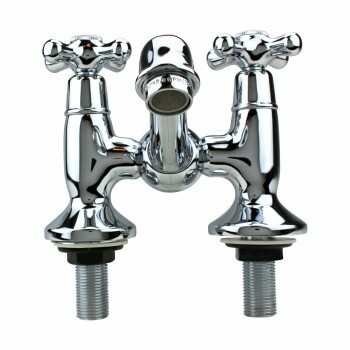 Faucet comes with supply lines and mounting hardware. Measures: 7 in. H x 4 3/4 in. proj. x 2 1/2 in spout to counter. Single Hole Faucets: Our single lever faucet is constructed of solid brass PVD, and has a top rated 500,000 cycle cartridge. 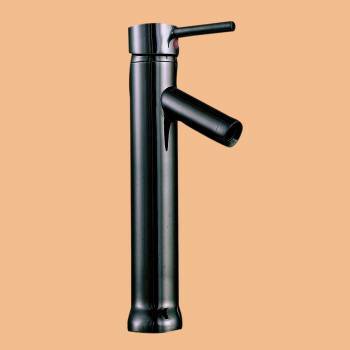 This tall single lever faucet has a straight spout and square body. Faucet comes with supply lines and mounting hardware. Measures 7 1/2 in. high and 4 in. from spout to counter. Single Hole Faucets: Our single lever faucet is constructed of solid brass PVD, and has a top rated 500,000 cycle cartridge. 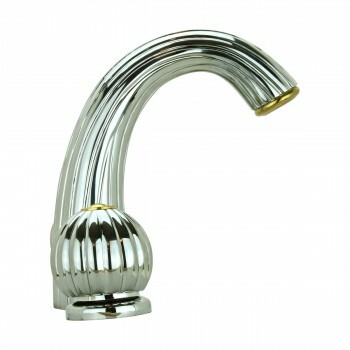 This short single lever faucet has a curved spout and round body. Faucet comes with supply lines and mounting hardware. Measures 9 1/2 in. H x 5 1/2 in. proj. x 5-1/2 in. from spout to counter. 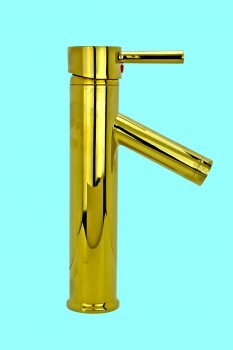 Our single lever faucet is constructed of solid brass PVD, and has a top rated 500,000 cycle cartridge. This short single lever faucet has a straight spout and round body. Faucet comes with supply lines and mounting hardware. Measures 11.75 in. H x 4.5 in. x 7 in. from spout to counter. 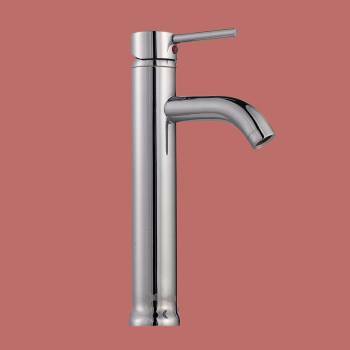 Satin Nickel Single Hole Faucets: Our single lever faucet is constructed of solid brass and has a top rated 500,000 cycle cartridge. 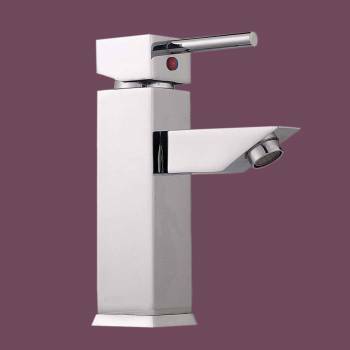 This short single lever faucet has a curved spout and triangular body. Faucet comes with supply lines and mounting hardware. Measures: 5 3/4 in. high x 1 in. from spout to counter. Single Hole Faucets: Our single lever faucet is constructed of solid brass, chrome-plating finish, and has a top rated 500,000 cycle cartridge. 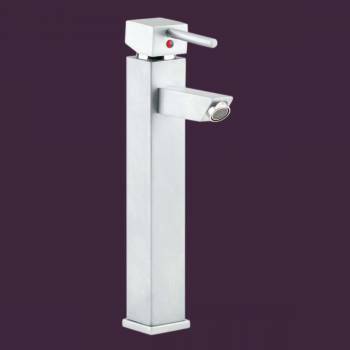 This short single lever faucet has a straight spout and square body. Faucet comes with supply lines and mounting hardware. Measures 12 1/4 in. high and 8 3/4 in. from spout to counter. 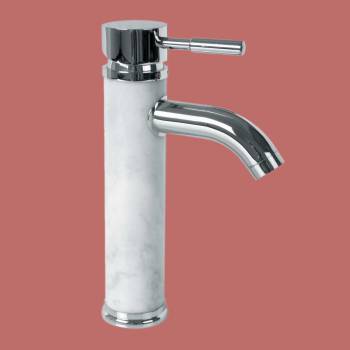 Marble & Chrome Single Hole Faucets: Made of solid brass with tarnish resistant chrome plating & hand-carved white marble body, this faucet boasts a top rated 500,000-cycle cartridge. Its modern & sleek design offers a compact & hassle-free one-handed lever. Due to the unique nature of natural stone, the veining may vary slightly from the image shown. Includes supply lines, drain sold separately. Measures 6 in. high and 2 5/8 in. from spout to counter. 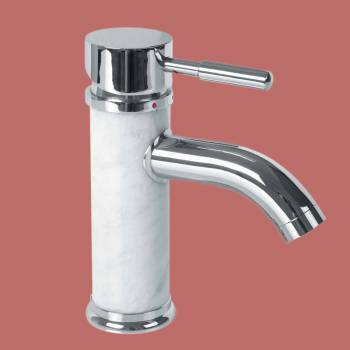 Marble & Chrome Single Hole Faucets: Made of solid brass with tarnish resistant chrome plating & hand-carved white marble body, this faucet boasts a top rated 500,000-cycle cartridge. 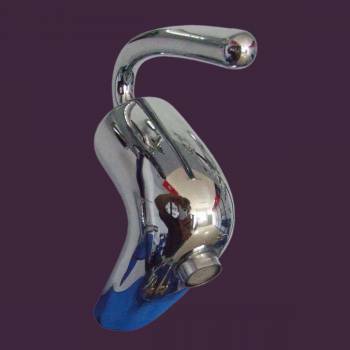 Its modern & sleek design offers a compact & hassle-free one-handed lever. Due to the unique nature of natural stone, the veining may vary slightly from the image shown. Includes supply lines, drain sold separately. Measures 8 5/8 in. high and 5 1/8 in. from spout to counter. 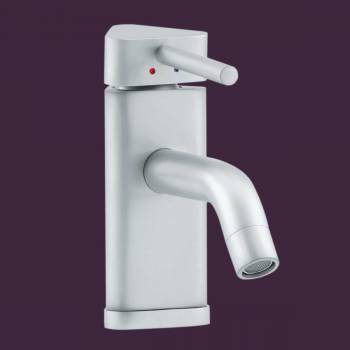 Turbo Faucet: Modern single hole faucet is a riveting addition to any to any bathroom! You will not find a better faucet for this price. 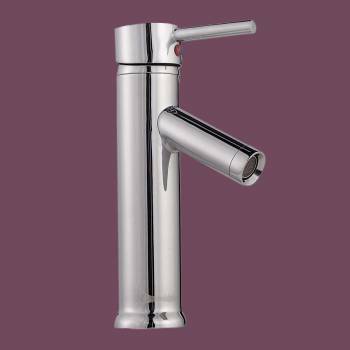 Manufactured of solid brass with tarnish resistant chrome-plating its modern & sleek design offers a compact & hassle-free one-handed lever. Includes supply lines, drain sold separately. Measures: 8 in. high x 3 7/16 in. from spout to counter. 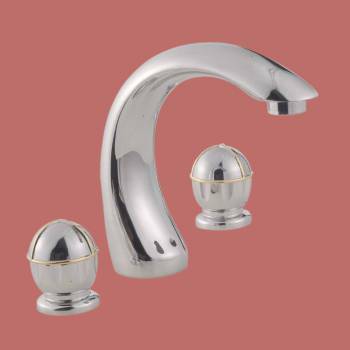 Tiki Single Hole Faucets: Constructed of solid brass & a tarnish resistant chrome-plated finish this faucet has a top rated 500,000 cycle ceramic cartridge. Ergonomic easy-grab single lever is easy to use. Beautifully designed this bamboo style faucet has a swiveling spout & provides a "Spa-like" feel to your kitchen, bathroom or wet bar. Supply lines & mounting hardware included, drain sold separately. Measures: 12 1/8 in. H x 4 3/4 in. proj. x 9 1/2 in. spout to counter. Chrome on brass 4 inch centerset faucet. Beautiful porcelain lever handle. One lever operation. You will not find a better faucet for this price! Measures 4 3/16 in. H x 5 3/4 in. proj. 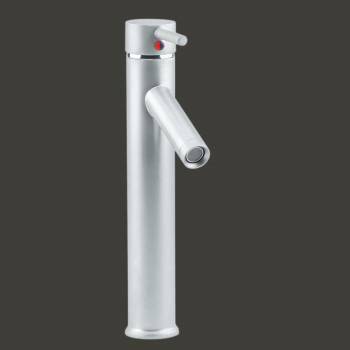 x 1 1/2 in spout to counter height. Single Hole Faucets: Our single lever faucet is constructed of solid brass, black nickel finish, and has a top rated 500,000 cycle cartridge. 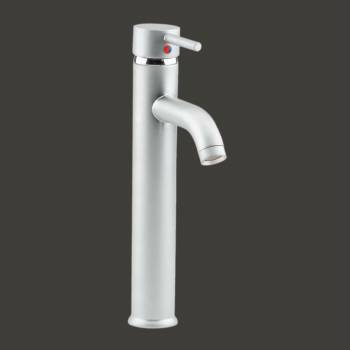 This tall single lever faucet has a straight spout and round body. Faucet comes with supply lines and mounting hardware. Measures 11 3/4 in. H x 4 1/2 in. x 7 in. from spout to counter. Single Hole Faucets: Our single lever faucet is constructed of solid brass, chrome-plating finish, and has a top rated 500,000 cycle cartridge. This short single lever faucet has a straight spout and round body. Faucet comes with supply lines and mounting hardware. Measures: 7 3/4 in. H x 6 in. proj. x 3 1/4 in spout to counter. 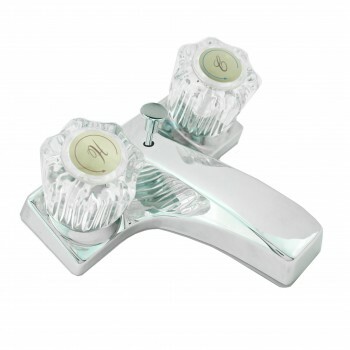 Bathroom Faucet 4" Centerset chrome-plated over zinc alloy with two clear acrylic handles. It has 1/4 turn washer-less valves. It comes complete with pop-up drain. Bathroom Faucets: This black gold plated over solid brass Euro-style faucet is perfect for a centerset sink. This is washerless and measures 4 1/4 inch high. Pull-out plug not included. Does not include pop-up drain.